In Brittany, the westernmost region in France, butter is a way of life. Since the middle ages, people there have used a distinctive, sea-salty butter in all sorts of cooking, including this supremely simple cake. Kudos to those middle age people - they knew what was good for them, even back then. The trick here is to use the best quality butter you can find, because this cake uses a lot of butter. If you can find the european kind, this cake will be your new go-to favorite. There is just nothing like butter guys - nothing. This cake also has lots of different names depending on the region and/or country. In this case this particular one was inspired by a Gâteau Basque, one of Beranbaum’s all-time favorite desserts, a simple cake meets pastry that is popular in the Basque and Brittany regions of France. Some versions have a layer of pastry cream inside or even jam, some don’t. 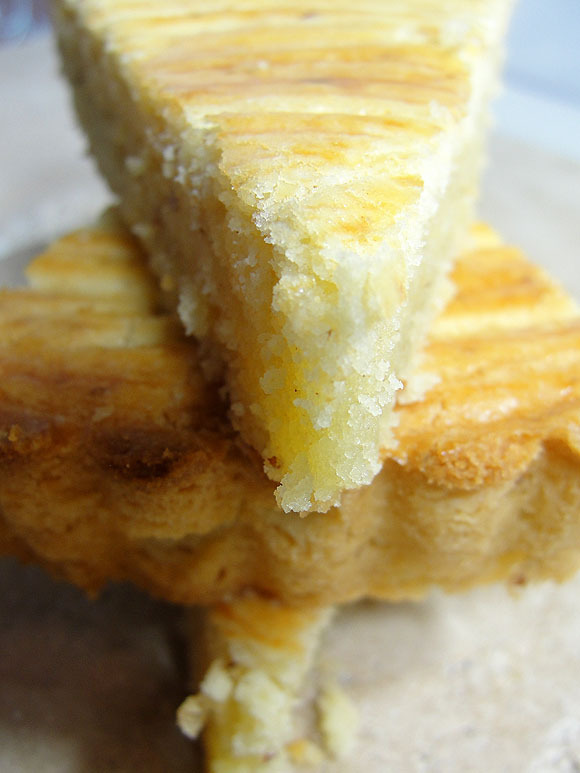 This specific version does not have anything inside, except lots of butter, a bit of rum, almonds and your usual eggs and flour which creates a cake that is dense, crisp texture, similar to shortbread. After the major production of the trifle, this was a breeze to make - let me write that gain for those in the back road - easy, as in super easy. No complicated instructions, no use of a gazzilion pots and pans. This is straight up a quick cake to put togehter, bake and very, very hard to keep around once it comes out of the oven. I have done this cake before, a couple of years back, Martha Stewart published it in one of your magazines and I proptly ripped it out and made it over and over again. It’s a perfect little cake to have around to have with your morning coffee, or as an afternoon snack, or simply because it’s sitting there and the buttery goodness is calling out to you and you simply can not resist it’s calling you. If I have to compare them side by side, I have to be honest and say that I liked Martha’s version a bit better, it just seems that its much more moist than Rose’s and mainly because in Rose’s recipe she only uses one egg, as oppose of Martha’s which uses 6 yolks plus 1 whole egg. The fact that she also uses almonds is what makes me be a bit on the fence, because I love anything that has almonds in it. I’m thinking that I may have to just put them side by side and come up with my own version incorporating the stuff I like most in each. I think I just discovered the art of recipe development folks. Since I can not post Rose’s recipe here due to publishers rules. I will share the one that I have from Martha’s and point you here, where you can find Rose’s version of this buttery cake. Me: I thought it was a bit dry as well, but then I was comparing it to my usual recipe. Like Tom, I also like the almond and rum take on it, which I plan to incorporate and adapt the recipe above with those two ingredients.